Last week, Riot Fest organizers announced that they would begin revealing the festival's lineup on Wednesday, May 30. This morning, instead of being greeted by a list of bands rendered in various font sizes, Riot Fest fans were treated to a lineup teaser video filled with "much more obvious hints" than some of the willfully oblique clues that organizers have dropped ahead of past editions of the fest. 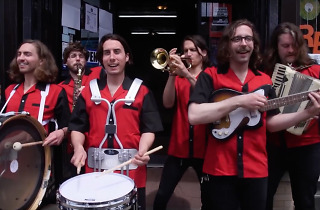 In the video, which you can watch below, a roving polka band portrayed by local rockers Archie Powel and the Exports visits a variety of Chicago locales, including the Wiener's Circle, Pinwheel Records in Pilsen, the JBTV studios and the home of the White Sox (a.k.a. Guaranteed Rate Field). 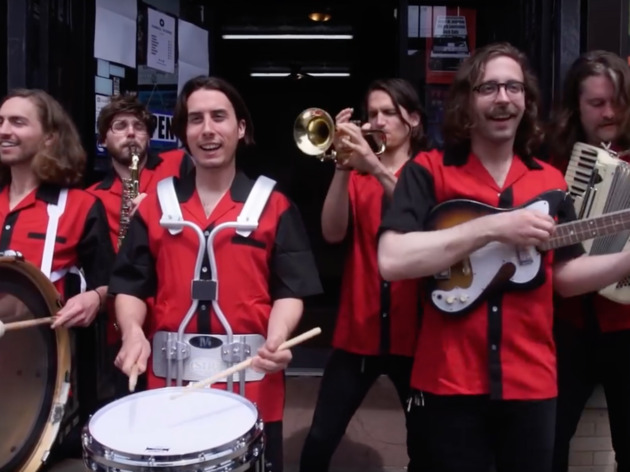 Sharp-eared listeners will be able to pick out some familiar melodies being reinterpreted as rollicking polka numbers—the video features oompah covers of the Dropkick Murphys' "Shipping Up to Boston," Alkaline Trio's "We've Had Enough," Blondie's "Call Me," Beck's "Loser," Jerry Lee Lewis's "Great Balls of Fire" and a brief snippet of what sounds like Elvis Costello's "Radio, Radio." Riot Fest enjoys trolling its fans (remember when the festival faked the theft of its Bitchin' Camaro? ), so a few polka covers aren't exactly conclusive proof that any of these artists will be on the lineup, but a bit of searching confirms that all of the aforementioned acts have some space in their schedules during the weekend of September 14–16. Will we get to dance to the New Wave strains of Blondie, mosh in front of the Dropkick Murphys and tap our toes to the legendary Jerry Lee Lewis in Douglas Park this summer? We'll get some answers when Riot Fest officially releases the first wave of its 2018 lineup at 8pm this evening. For now, enjoy the polka and speculation.